Hood River, Oregon – April 11, 2017 – The perfect blonde is from Hood River. 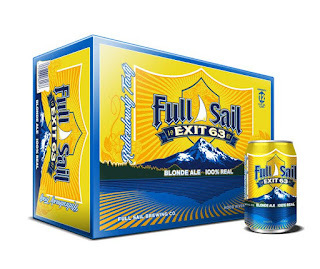 Approachable and easygoing, Full Sail’s new Exit 63 Blonde Ale is 100% real. Full Sail has been sustainably brewing authentic craft beer using locally sourced ingredients since 1987, and Exit 63 Blonde Ale – in sunny, take-anywhere cans – is no exception. Inspired by that sense of place, Exit 63 is brewed with water from glacier-fed springs off the slopes of Mt. Hood, and Northwest-grown barley and hops from the fields of Yakima and Willamette valleys. Golden blonde in the glass and smooth on the palate, this ale evokes the brighter and warmer days of summer. Subtle notes of spice and a light body define this easy-drinking beer. Light and refreshing but never boring, this American blonde is like sunshine in a can whatever the weather. Exit 63 Blonde Ale is available year-round in aluminum, 12 oz. cans in 6-packs, 12-packs and on draft. 5% ABV, 16 IBUs.